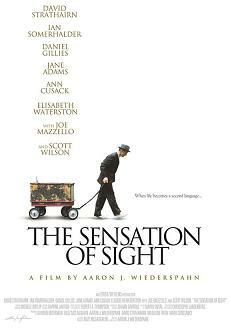 Like a delicately designed patchwork quilt, The Sensation Of Sight is crafted from the odds and ends raw material of its seemingly aimless, brooding characters, then ultimately surprises with its fusion of introspection and emotion. First time director Aaron J. Wiederspahn allows his story the casual, though at times much too generous space to breathe life into the troubled souls who populate his poetic landscape, as it courses through New Hampshire’s majestic yet isolating terrain. David Strathairn is the hypnotic, enigmatic centerpiece of The Sensation Of Sight as Finn. He’s a middle aged high school teacher who, for some as yet unexplained reason, has left his job and family to sell encyclopedias around town out of a toy wagon, though he hasn’t yet quite figured how to go about it, or for what price. Along the way, he encounters an assortment of conflicted locals who all have some incidental life connection to Finn. There’s also a mute, shadowy character, a young man who silently stalks some of the inhabitants, and appears to be quite invisible to others. To give away much more would spoil the mystical flow and pervasive psychological mystery of this story, as its narrative strands eventually intertwine with alternating fragments of real life encounters, anxious memory and discomforting daydreams. And always with Strathairn’s Finn as the nearly broken, perplexed, downcast, and also oddly humorous Chaplinesque figure, whose own transformative experienced ‘sensation of sight’ imparts a tentative metaphorical healing vision of a restored life.